The S&P 500 and Dow Industrials edged higher last Friday, but pared intra-day gains during the final few minutes of trade as investors locked in profits for the month and second quarter. The S&P 500 was unable to extend back-to-back weekly gains as renewed selling in technology and energy largely offset advances in financials and energy. The Dow Industrials ended a five-week winning streak, while the NASDAQ Composite shed nearly 2% last week and has declined in three of the past four weeks. Coming off its June 8 all-time high of 6,321.76, the pullback on the Composite has so far been limited to less than 3%. Still, the NASDAQ Composite had its best first-half performance of a year since 2009. Similarly, the S&P 500 and Dow Industrials both extended their quarterly gains to post their strongest first-half performances in four years. For the week, the S&P 500 fell -0.58%, the Dow Industrials slipped -0.21%, and the MSCI EAFE (developed international) fell -0.26%. Since the start of second quarter, U.S. economic data have been mixed. On one hand, the unemployment rate has fallen to 4.3% and consumer confidence remains at elevated levels. On the other hand, the demand side of the economy (i.e. light vehicle sales, housing starts, net exports and inventory growth, etc.) has disappointed in recent months, coming in below expectations and prior readings. While future data releases bear watching, it is worth viewing recent weakness in the context of the long-term drivers of economic growth. As Chart 1 illustrates, real GDP growth is driven largely by the supply side (i.e. private payroll growth), and while second quarter GDP may look similar to the subpar reading seen in the first quarter, this weakness is being driven by a slowdown in demand. As a result, investors should not panic, as the steadiness of employment growth suggests this potential slowdown will not be as severe as some expect. 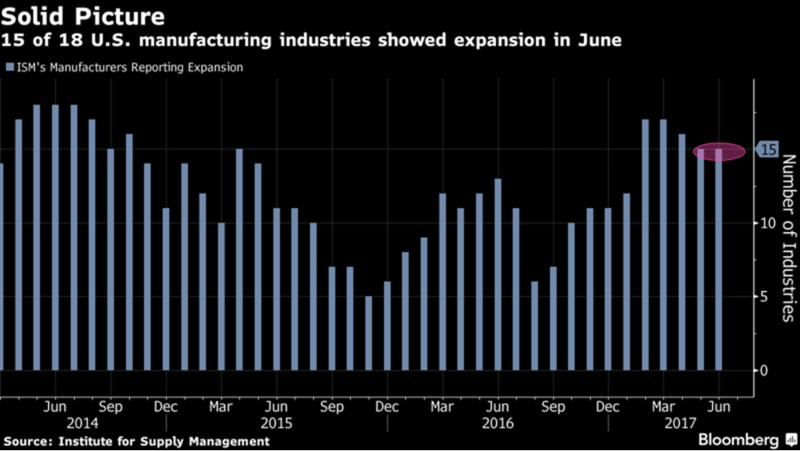 Furthermore, according to J.P. Morgan, with private payroll growth remaining stable but exports, inventories and government spending all weaker in the first half, the economy is primed for a likely bounce back in the second half of the year. As a result, the continuation of a moderate but healthy economic expansion suggests that investors should stay the course and not deviate meaningfully from their predetermined asset allocation strategy.